11 years ago this month, we were beginning the process of joining Operation Mobilization. With a baby Aliya, who was just 3 months old, we ventured down to the OM headquarters near Atlanta for their “Outbound Conference” for new recruits. After this time, we began the process of raising support to go to South Africa. It was on January 1, 2002 that we landed in South Africa (with a then-6-month-old Aliya) to begin what would ultimately be an 8-year stint at the Training Center in Pretoria. After those 8 years, we uprooted and relocated our family (which by then consisted of an 8-year-old Aliya, 6-year-old Gabi and 5-year-old Julianna) to Panama, Central America. It has been a journey of epic proportions in our lives! And now, God is leading us on a new adventure in a new direction! After these almost-11 years, God is leading us out of full-time missions and into the “secular” world; specifically back to the USA. Those are words we thought we’d never say, but as always, God is directing in ways we never imagined. There have been a series of events that have led to this decision. One of things that has been an on-going struggle has been our continual battle to maintain full financial support. This has pretty much been a fact of life for us for these almost-11 years. It has been one of the biggest struggles we have had as missionaries. Another thing has been the education of our girls. It has been difficult since we’ve been here in Panama, especially with Julianna. She needs some extra help and we just can’t seem to find it for her here. We are also concerned for Aliya, who has not made a single friend here. 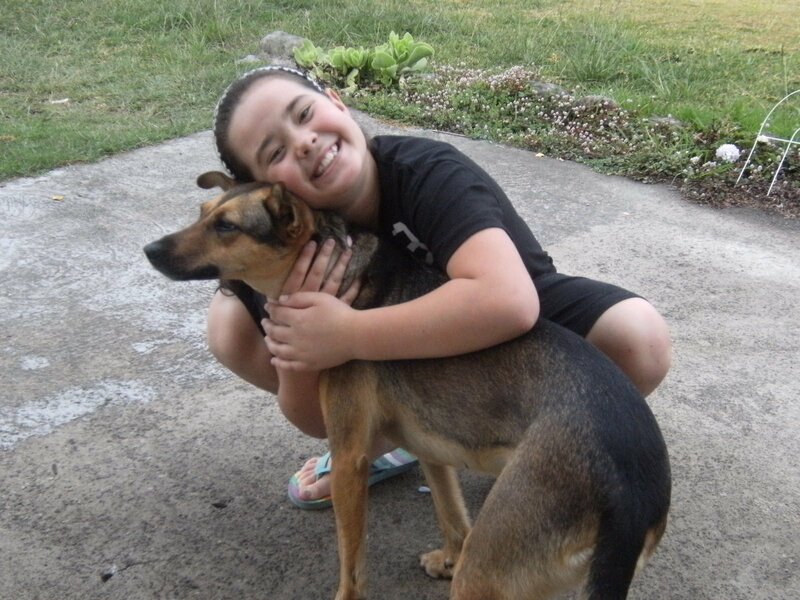 She is 11 years old and at a time in her life where she really needs to have a good friend. She has been homeschooling this year, which obviously hasn’t helped in the friendship-area. But I can really see this issue taking a toll on her. She’s lonely. It really breaks my heart. I don’t ever want our life-choices, especially in regards to ministry, to be an issue in the girls’ lives when they get older. And we don’t want to compromise our family’s well-being, or development (both academically and socially) to suffer. In June, we hit a bit of a brick wall in terms of Clint’s US Residency Permit and the process of obtaining his US Citizenship. This has been an almost-13 year process and we thought we might have to leave Panama so that we could sort this thing out from the USA. However, once we discovered that we could do that process from Panama, we were okay with that. But you know what I realized? While we thought that we were going to have to move back to the USA, I realized that I was actually okay with that. This was a BIG realization for me. In all of our years as missionaries, we never could have imagined living in the USA…until June. This realization really caught our attention. And then my dad was diagnosed with the C-word. Cancer. I usually like to pride myself on being strong and “capable”. But this diagnosis really rocked my planet a little bit off its axis. It got both of us thinking that maybe God is trying to say something to us about our future. We realize that our kids have never really lived close to my side of the family. What if something happens to one of my parents and my kids never had the chance to know them? Then, in the middle of all of this, Clint received an email from Chrsyler, following up on the application he submitted 2 years ago! What timing is that?! So, he continued that process and has already had his initial interview on the phone with them! We had talked to the girls early on during this thought-process and unanimously, they agreed that this is a great decision! They have been overly excited about this and are SO looking forward to living so close to their cousins, Grace and Jack. Gabi especially keeps talking about how excited she is to hang out with Jack! They are only 3 months apart in age so it will be great that they have each other. And we believe they are all going to make some great friendships at school and at church! So…..our plan is be here for the end of the current School of Missions. Graduation for them is October 14. So, we will be leaving after that, sometime between the 14th and the end of October. Obviously, there are so many logistics to work out, but this is where we are right now! We are so excited and really feel such a sense of peace through this decision. Stay tuned for more posts about this next epic journey in our lives! Yeah, I am totally blogging about my dog. Last night, we had to put Ilah down and it was terrible. We got Ilah just a week after we moved to Panama. She had been rescued out of a really bad situation and was just skin and bones when Dottie picked her up. When Dottie heard that we were new in town and looking for a female dog, not a puppy, not too old, not too big, she knew Ilah could be the perfect match for us. So, she brought Ilah over and of course we all fell in love with her. 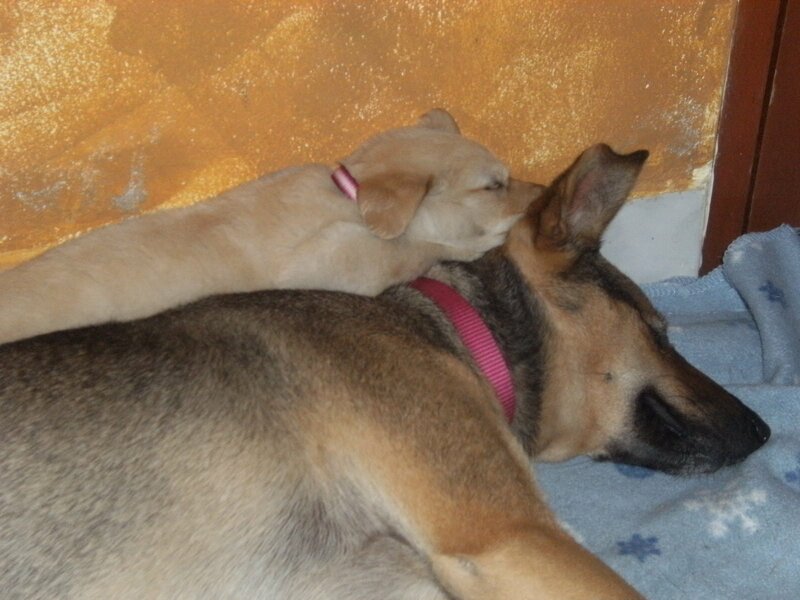 Ilah never liked other dogs. That was the reason Dottie couldn’t keep her at her house because Ilah wanted to fight with the other dogs all the time (Dottie has 13 dogs!!). Just a couple of weeks after we got Ilah, she escaped and came home bloody and requiring stitches in several places. She lost her right eye in that fight and subsequently went blind in her other eye because of an infection. So, the blindness made her even more aggressive with other dogs. So, when we were given a Golden Retriever puppy, we were nervous about how Ilah would take to the puppy and if she would hurt her. Well, Ilah immediately took over as Meisie’s mommy, taking care of her and cleaning up her poopie. 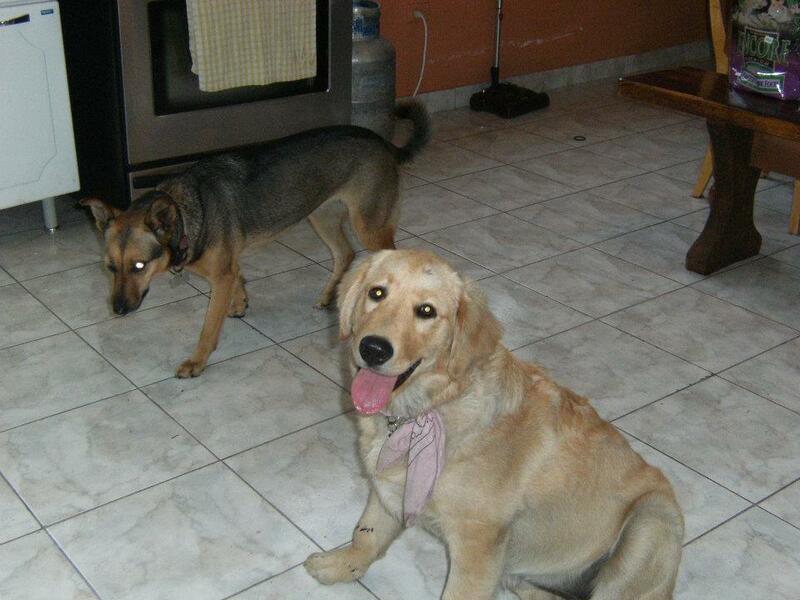 We were so surprised (and relieved) that Ilah took Meisie under her wing and didn’t kill her. Here is a really sweet picture, just a few days after Meisie came home to us. She would just crawl up on Ilah and sleep there – and Ilah let her! So sweet! Over the past year and half there have been numerous health issues with Ilah, especially as a result of her losing her eye and have infection after infection in that socket. So, when she escaped 3 days ago and came back 5 hours later all beat up yet again, we decided it was in her best interest – and to save the trauma for the kids that happens every time she comes home like this! – to put her down. She was in so much pain these last 2 days from this last fight, that it did really feel like the right thing to do. Although that doesn’t make it easier. 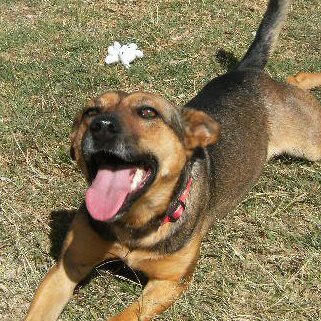 She was a sweet, gentle and loving dog to us and we will miss her a lot. I think Meisie will miss her, too. Last night, a friend at our church here in Panama looked at my new tattoo and asked me what it means. I thought maybe it’s good to explain. I really love tattoos. I know they can be “controversial” in Christian circles and there are some who feel that you cannot be a Christian and have tattoos (or drink alcohol, but this post is not about that….). Obviously, I disagree. For me, tattoos tell a story and are there as permanent reminders. Everyone gets tattoos for different reasons. 3 of my 4 tattoos have a story and remind me of something or someone or some time period in my life. So, here’s the story about my tattoos. Tattoo #2: (2009) A ring tattoo under my wedding ring. In 2007, we visited the Wycliffe Discovery Center in Orlando at their headquarters. It’s an interactive exploration center where you can experience different cultures and languages. One of the interactive models they have is a place where you can put your name in and it prints out your name in a bunch of different languages. We did that with all 5 of our names. I especially loved seeing the girls’ names in their original Hebrew (not planning it, we named all 3 of our daughters Hebrew names!). So, that got me thinking about how that would make a cool tattoo. So, I thought about it for a couple of years and in August of 2009, I took my idea to the tattoo artist. 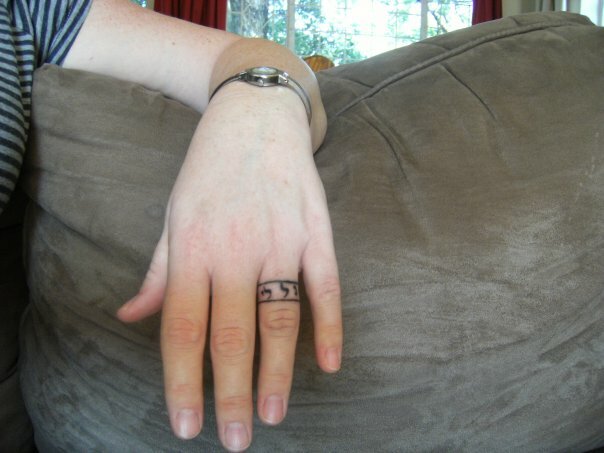 The full Hebrew names, while short, were too long to put on my ring finger. My idea was that I would put all three of their names under my wedding ring, signifying that my relationship with their dad is covering them. Instead of tattooing their whole names, we opted to just use their first Hebrew character of each of their names. So, that is what is on my ring finger. I love this tattoo very much because I love my children and I love my husband. We have an awesome marriage and I love the symbolism of our relationship covering the kids. Tattoo #3: (2009) If you scroll through my blog to the earlier posts, you will read about the journey we went through in 2009 with my SEEEESTER Jenny and her breast cancer. Well, her life verse has always been Psalm 92:12 “…and the righteous will flourish like a palm tree.” The palm tree has always held a special meaning for Seeeeester and Seeeeeeester has always held a special place for me. So, when she started talking about wanting to get a tattoo as a reminder of the promise of Ps. 92:12 and as a reminder of what God brought her through in 2009, I said I wanted to do it with her. 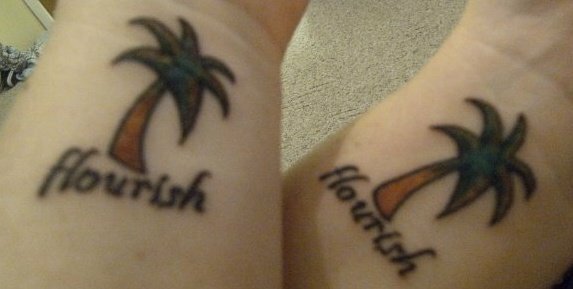 So, in December of that year, we got these palm trees with the word “flourish”. When we got the tats, they were so much bigger than we had originally thought they would be. At first, I felt a little sick about getting such a “big” tattoo. However, over the years, I have gotten so used to seeing that palm tree on my wrist and realizing that it really isn’t “big”! I have never once regretting this tattoo! I’m amazed at the amount of times in these 3 years that looking down at that tattoo and being reminded of that promise that I have been encouraged and blessed. It holds very special meaning, as well, because there really is no bond like the bond between sisters. My sister is my best friend and I love that we did this together. Tattoo #4 (2012): Just over a year ago, I was home for my Seeeester’s 40th birthday (yes, she is over 40 now and no matter what she might tell you, SHE is the oldest one). One day, I was with my Daddy at Big Ben coffee shop in Kokomo and he introduced me to Jayme Whitaker who is a Christian tattoo artist. Dad told Jayme that he wanted to get this tattoo and Jayme said he would be honored to do it for Dad. So, a few months ago, Dad got his first tattoo at age 66. Now, knowing my Dad and his “story” I have always been surprised that he never had a tattoo before. He was in Viet Nam in the 60’s and during that time, soldiers were not allowed to get tattoos because they were considered “property” of the US government. Still surprising that Dad never got one after Viet Nam, but he didn’t. So, his tattoo is of his unit’s (the 196th Light Infantry) insignia from Viet Nam. Over the insignia is a 3-nailed cross, because Dad has experienced true freedom and redemption from everything he experienced in Viet Nam, through the Cross. Under the insignia is a drop of blood, along with the 2 purple hearts he earned during the War. I love what all of this signifies. As Americans, we often talk about how “Freedom isn’t free” but unless you’ve experienced the price that is really being paid, or you hear about it from someone very close to you, it’s hard to really appreciate the sacrifice that our military is making. The War in Viet Nam was even more gruelling and traumatic than most people realize and those men, who were really just little boys, came home to an angry country with no thanks at all. When my dad arrived back from Viet Nam, to the USA, in his uniform, a college-aged girl actually walked up to him in the airport and spit on his uniform. This was his welcome home. After Dad met Jesus some 9 years later, it would take many, many more years before he would talk about his experiences. Growing up, I knew this was not something to ask Daddy about. We just didn’t talk about it. But in the last several years, Dad has talked about it. More than he ever wanted to, I think. But through the talking, healing has come. Freedom has come. Redemption has come. And he got this tattoo as a forever reminder that the Cross has redeemed every part of his time in Viet Nam. I knew immediately that I wanted the same cross that Dad got. Then, this year came with all its unexpected twists and turns, mostly in the form of Dad’s cancer. When we decided that I should go home to Indiana for a couple of weeks, I immediately knew that I wanted to get this cross tattoo. I had already decided that I wanted it on my other wrist. I asked Dad if Jayme would be willing to do it while I was home. Then Seeeester wanted to do it, too…as a way to honor our Daddy. 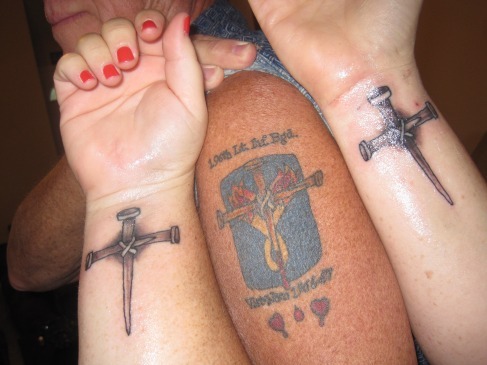 So, this is the 3-nailed cross with Jenny’s wrist on the left side of the photo and mine on the right. I really love this tattoo and all that it symbolizes in my Dad’s life, and in my life. I am who I am today because of all that Daddy has been through to make him who he is today. So, this is the story of my tattoos. I’d love to hear from you about your thoughts on tats and if you have any and what they mean! All I can really do right now is sigh the biggest, grandest sigh of relief ever. I feel like I can take a full, deep breath for the first time in 3 weeks. Dad had his appointment with the oncologist – the appointment to get the results from his PET scan and bone marrow biopsy. This appointment has been anticipated for the last week and a half. But I’ll tell you what: that week and a half felt like a year and a half! The news is so much better than what I anticipated! The scan and biopsy showed no signs of lymphoma in his bones, bone marrow or anywhere in his body! PRAISE THE LORD! I seriously believe that there has never been an oncologist appointment so covered in prayer as Dad’s was today! Although this prognosis is awesome and amazing, he wasn’t exactly given the “all clear, don’t come back ever again.” The PET scan showed a couple of areas of concern but definitely not in the lymph nodes and the doctor is not too concerned about them. He has ordered another test and Dad will go back in a month. But, we are rejoicing and praising the Lord this evening! If you want more of the details of what the doctor said, you can read it on my sister’s blog…the link is over to the right under “blogs i follow”; it’s called “My Flourishing Family”. I want to share a little bit about what’s been in my heart this week. I got back to Panama on Sunday, 3 days ago. It has been wonderful to be with Clint and the girls again and I have really enjoyed being with them. But my heart has been so heavy with worry for my Daddy. Honestly, I didn’t even want to come back to Panama from the States. From about my 3rd day in the States, I was already crying daily about the fact that I would have to leave. I kept telling Clint that I wished he and the girls could just come up there and we could all just stay there with Daddy (and Grandpa). But of course, that wasn’t possible, for obvious reasons. So, I have been here for the last 3 days, feeling really emotional and apprehensive. I have pretty much stayed at home with my family, waiting for today’s test results. On the other side of this news, I have also been so blessed by the amount of encouragement that I have received, as well as how much support and love my family has. We are blessed beyond measure. So, today, I want to thank those of you who have been praying. Please continue to do so. When I come online to blog, I’m always shocked at how long I’ve waited between posts. I don’t know why that is, but it is. Whether I am blogging regularly or not, life is still happening. And boy, has life been happening here! As I am typing right now, I am sitting in my bed in Panama for the first time in over 2 weeks. For the past 2 weeks, I have been in Indiana with my Mom and Dad and my sister and her family. I flew home after we got the news that my dad has been diagnosed with Lymphoma. Cancer. The ugliest of words. I sat here in Panama and just knew that I needed to go home to be with them during these couple of weeks of appointments and tests. It was a great time to be there; I was able to go along to the first appointment with the oncologist, be there for the PET scan (What is a PET scan? Check out this info: http://www.petscaninfo.com/zportal/portals/pat/cancer); be there for (and watch!) the bone marrow aspiration and biopsy (wow….just a side note and piece of advice: If you ever need one of those, request to be put to sleep for it. Believe me.). It was wonderful that I could be part of all of that but it was a difficult time. There have been many tears shed, many prayers prayed. I will be forever grateful for these 2 weeks that I spent with my family. This is one of the hardest things of living far away….not being a part of their everyday lives, especially during the difficult times. My heart aches right now, with the longing to be with my Dad, but I’m also content and happy to be back with my husband and kids in Panama. It’s bittersweet. As I prepared to leave Indiana to come back to Panama, one thing made a forever impression on my heart: I realized that my Dad is surrounded by a community of people who love him as much as I do and will support him and my family, no matter what. Unconditional love, support and care. This made leaving a bit more bearable. Knowing that he will need nothing. My dad has a lot of “Aarons and Hurs” in his life and I’m so thankful for them. One of those “Aarons and Hurs” is my sister, Jennifer. 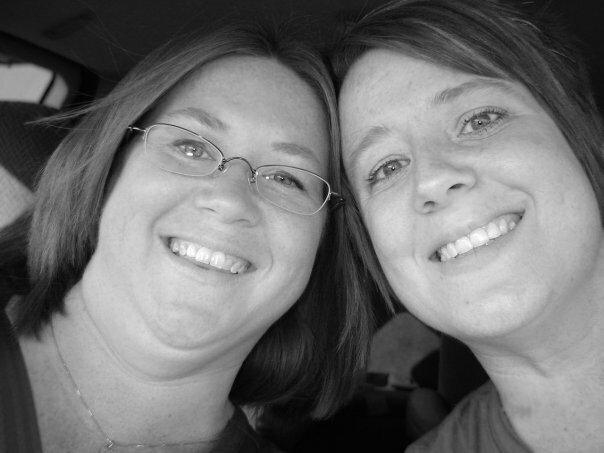 She has been a lot of things to me in my life, but most importantly is that she has been my best friend. I’m so thankful for the way that she has, without complaint, taken on the role of “torchbearer” for us 3 siblings. I am in Panama. 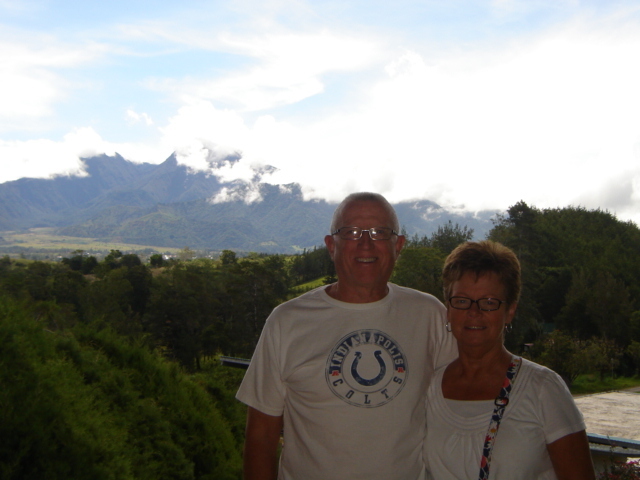 Our brother and his family are also far away, in Vanuatu. Jenny is the only one of us that is at home and there to be with Mom and Dad on a daily basis. She will be at all the appointments, taking notes of what the doctors are saying, so that she can clearly communicate with us exactly what is going on throughout this process. Thank you, Seester, for stepping up to the plate and always being ready. So, wherever you are in this world right now, thank you for reading this and thank you for praying for our family. I don’t think I’ve ever blogged a recipe before but this one was so easy and yummy and filling that I think it has earned a spot on my blog. The original recipe was one I found in my Better Homes & Gardens cookbook. But I almost never follow a recipe to a tee because I’m just a rebel like that. 2. In a large saucepan cook onion, sweet pepper, and garlic in hot oil until vegetables are tender. Stir in black beans, undrained tomatoes, tomato juice, corn, uncooked rice, chili powder, red pepper, and 1/2 tsp salt. Bring to boiling. Transfer rice mixture to a 9 x 13 casserole dish. Arrange chicken pieces on top of rice mixture. Sprinkle chicken with paprika. 3. Bake, covered, in a 375 degree oven for 45 to 50 minutes or until chicken is no longer pink (170 degrees for breasts: 180 degree for thighs and drumsticks) and rice is tender. We had a salad before this but you should not feel, in any way, obligated to follow my example. The food was very filling and delicious, although we did need to add a bit of salt to each individual plate. I figure it’s better to have too little salt because you can always add more. Obviously, the opposite would not work. If you try this recipe, please let me know how it worked for you and if you made any changes or tweaked it at all! Today we picked up our miracle car. A true miracle and we know it was only from God. After 4 months of sitting in our driveway, we finally sold our broken-down heap of a MItsubishi….what a relief! Once we had that cash in hand, we started looking, looking, looking for a vehicle. We found many leads but none that seemed truly right. It’s very strange that so many people will post a car online for sale and then never answer their phone or email. There were many a closed door in our faces in this process. My parents arrived here in Panama for a 2 week visit so Aliya and I went to Panama City to pick them up and do some sightseeing. 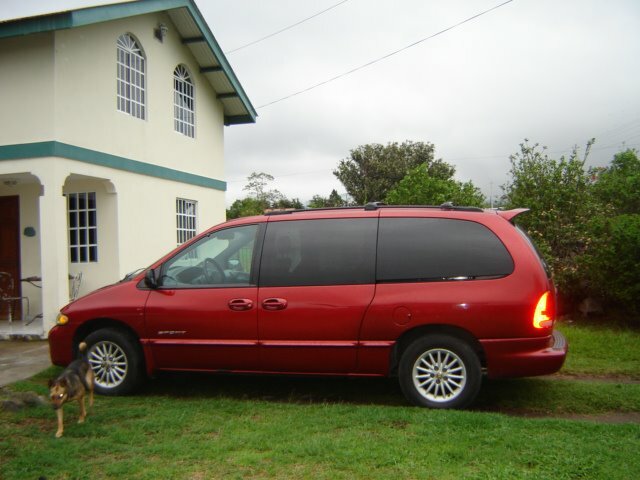 There was a Chrysler Town & Country van that I wanted to look at, so we worked that into our schedule for the one full day that we would be in the City. We met the Colombian guy who was selling it. I really felt in my heart that this was what God wanted for us. Dad looked over everything and while it was not a perfect vehicle, he also agreed that this was a strong, reliable, good car for us. So, we started the process of negotiation with the guy and he was so nice. Clint wired the money for the car to me so I could pay the guy the next day, as per our verbal agreement. The next day came and the seller told me that his mechanic was still busy fixing a couple of the small issues on the van. After that conversation, I was never able to get ahold of him again…apparently, he blocked my number. Needless to say, I was extremely disappointed about this. I really thought that this was the right car for us! Over the next week, while Mom and Dad were here, we continued to look around and make lots of phone calls about cars. We even test drove one down in David. Nothing felt right. Then we just decided to put the search on hold until after Mom and Dad leave because we just wanted to enjoy our time with them and not be so preoccupied with finding a car. So, we stopped looking or calling or anything. Yesterday, Dad preached at our church, Lighthouse Ministries (Ministerios Casa de Luz). After he preached, Pastor Roger called up Mom and Dad to pray for them but he also called up Clint and me and the girls. He mentioned how we really need a car and he prayed that God would supply our need. Last evening, Roger called Clint to say that his uncle, who had been in church, has a really nice Dodge van that he would sell to us. On top of that, some of the people of the church had collected some money for us to help toward a car. We were so blown away by how quickly God worked in people’s hearts to help us after Roger shared the need with them. We made arrangements to go down to David today to see the car. All of us pretty much felt like this was definitely a God-thing and I think we already knew we would buy the car before we even looked at it. Roger’s uncle came down on his price, but not quite down as much as we needed in order to be able to buy it with the money we had. But Roger told us that the church was going to add to the amount that had been donated from people in the church, which will make the church’s contribution $1000! This gave us the rest of what we needed to be able to get this van! Isn’t God so good?! We drove the van home today and right now, it is sitting in my driveway in the exact same spot that the broken down car sat for 4 months. God knew all along that He had this van waiting for us. He allowed all those other doors to be closed so that we would not make a mistake and step out of His will and His timing. It was a hard road to travel, but we have learned so much through it. One of the biggest things I’ve learned is that God’s Kingdom is full of amazing, loving, obedient servants who are willing to use the little they have to bless others and further His kingdom. As I go to bed tonight, I am blessed and humbled and reminded again that He is always faithful.